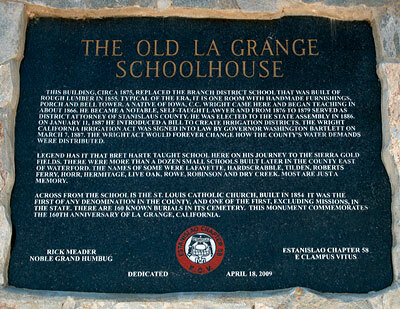 The La Grange schoolhouse is a good example of vernacular Greek Revival architecture found in 19th century California. Undoubtedly built partially as a byproduct of the prosperity accruing to LaGrange during the 1870's following a massive hydraulic mining operation in the area, the school was the community's first educational institution. Another wave of prosperity during the 1890's possibly coincided with the decision to add the picturesque tower and porch. Both the 1875 Greek Revival and the ca.1900 picturesque details present on the building's exterior are indicative of major stylistic trends in California at these periods. This building, circa 1875, replaced the Branch District School that was built of rough lumber in 1855. Typical of the era, it is one room with handmade furnishings, porch and bell tower. A native of Iowa, C. C. Wright came here and began teaching in about 1866. He became a notable, self-taught lawyer, and from 1876 to 1879 served as District Attorney of Stanislaus County. He was elected to the State Assembly in 1886. On January 11, 1887 he introduced a bill to create irrigation districts. The Wright California Irrigation Act was signed into law by Governor Washington Bartlett on March 7, 1887. The Wright Act would forever change how the county's water demands were distributed. 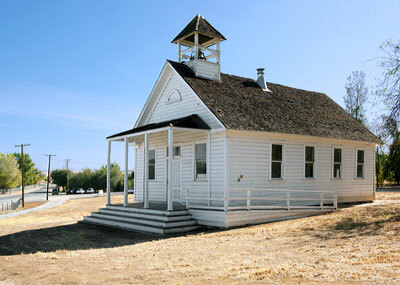 Legend has it that Bret Harte taught school here on his journey to the Sierra Gold Fields. There were more than a dozen small schools built later in the county east of Waterford. The names of some were Lafayette, Hardscrabble, Tilden, Roberts Ferry, Horr, Hemitage, Live Oak, Rowe, Robinson, and Dry Creek. Most are just a memory. Across from the school is the St. Louis Catholic Church, built in 1854 it was the first of any denomination in the county, and one of the first, excluding missions, in the state. There are 160 known burials in its cemetery. 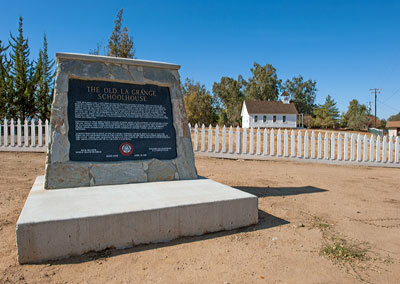 This monument commemorates the 160th anniversary of La Grange, California.